ATF's NEW & IMPROVED SFI approved Flywheel is made from Billet Aluminum and is now 5lbs lighter than our previous version.. Still withstands well over 2,000 horsepower. Fits both 1JZ and 2JZ Toyota engines. The ATF Billet Flywheel and Transmission Adapter system includes: • **NEW & LIGHTER ** SFI approved Billet Aluminum Flywheel • Gen2 Billet Aluminum Transmission Adapter with steel threaded inserts for durability • Billet Aluminum Starter Shim • Installation Instructions • The kit comes with all hardware • The kit also comes with ARP Flexplate bolts. Best if used with Red Locktight to prevent any loosening of the flexplate bolts (Torque to 70 ft lbs.) • The factory starter bolts are re-used • The torque converter bolts should be supplied with the purchase of the torque converter. • We recommend using a large bolt pattern GM torque converter with stock overall height. 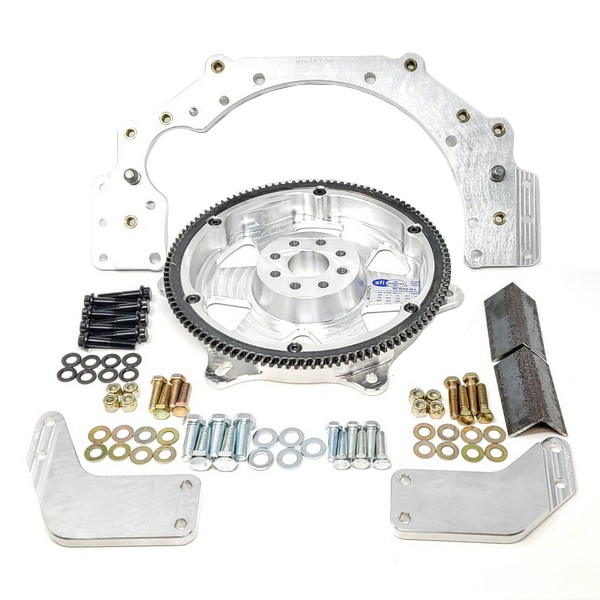 The ATF 2JZ Aluminum Flexplate Kit allows you to bolt any Chevrolet Transmission and Torque Converter to the back of the JZ engine, whether it is 1JZ or 2JZ does not matter. This Aluminum Flexplate allows you to bolt any Large or Small Bolt Pattern Torque Converter although we do recommend using the large bolt pattern converters with threaded holes The Torque Converter needs to be a Standard Height GM Torque Converter. Nothing custom needs to be made to mate it to the flexplate. All the work is done for you. This kit includes a Starter Shim to correctly align the starter bendix gear to the flexplate ring gear. You will need to drill out the starter holes with a 13/32" Drill Bit to remove the threads. You will use your original starter hardware to bolt it to the ATF Adapter Plate. Thus allowing removal of the transmission without the need to unbolt the Starter. Also just a note when installing the torque converter please check the converter spacing to prevent any damage to it or the transmission. The spacing between the flat area of the torque converter pad and the mating surface of the flexplate should be between .125" -.180". If there is any excessive gap a spacer will need to be added. This kit is made to not need these but must always be checked positively for any issues.